Commercial CCTV video surveillance systems have been proven to reduce crime for businesses, and provide effective risk mitigation for situations such as slip & falls and employee theft. With the advent of IP CCTV video surveillance cameras, the ability to accurately and effectively capture an incident and distribute high quality video to relevant authorities has never been easier or as cost-effective. 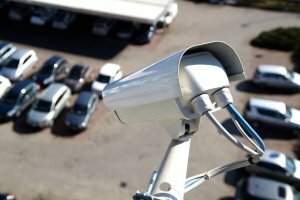 Often, the mere sight of a CCTV video surveillance camera in a business or commercial space can be enough to deter a would-be criminal from malicious activity. This can either shift the crime to a property which does not have a professionally installed CCTV system, or deter them from the idea altogether. It is with this idea in mind that people and business operators begin thinking about “fake” CCTV video systems. Dummy CCTV video systems are usually very simple: an old or model CCTV camera mounted in an area where it is plainly visible, often with signage indicating the property does indeed have video surveillance to further deter crime. You can often purchase these systems in “spy shops” or online. The question then becomes is installing these devices a good idea, or should you more seriously consider a true, professionally installed commercial CCTV video surveillance system for your business? On the surface, the thought process behind putting up a couple of fake or dummy CCTV cameras appears to be sound. As we noted above, one of the main benefits of a commerical CCTV system is deterring the crime altogether. Why go through the expense of purchasing a true commercial CCTV video surveillance system when you can get the same effect at a much lower cost? There are a couple of reasons why this thought doesn’t stand up. The first reason is the idea of public expectation. The sight of a camera (or posted notice that there are cameras) infers that events on site have been recorded via a commercial CCTV video surveillance system. The public could, rightly, expect that anything that happened in front of that camera would be recorded and used as evidence. If it is not, and the system is knowingly false, then you are opening yourself up to liability issues. Consider a scenario where a person is in trouble, and they have a choice: to move to an area which is being recorded, or to move to another area. Should they choose to move to the area based on the fact that it states it is being recorded (which is – in this case – false) and an incident were to occur there would be liability issues for the person who put up that fake CCTV video surveillance system. A second reason why this line of thinking doesn’t hold up is that the system doesn’t actually do anything. Suppose that there is an actual event on site, despite the cameras which have been mounted. What will they have captured, and how can you use that information? The answer is that they will not catch anything, as these CCTV video cameras attached to your business do not work, and you investment in them will have been worthless. If you’re investigating the idea of installing fake CCTV video systems, think again. Contact us to see how an actual, professionally installed commercial CCTV video system can provide superior surveillance, while eliminating the liability that comes with these fake or dummy CCTV cameras. Cyber Fire and Security offers the broadest selection of IP cameras designed for security surveillance in a wide variety of commercial and industrial settings. Our services includes CCTV installation London, Alarms, door access systems and home automation and video surveillance systems for commercial CCTV installation and home CCTV installation. Cyber Fire and Security is one of the leading CCTV installation companies specializes in electronic security systems, our company supply CCTV cameras, IP security cameras and video surveillance systems for commercial CCTV installation and home CCTV installation. Thanks for sharing these blog. The stuff you have explained about dummy CCTV video camera that they don’t actually do anything is really a nice point. Hi, the blog is very informative. Your blog helps people to make aware about fake and real CCTV cameras. Keep share such an informative information.